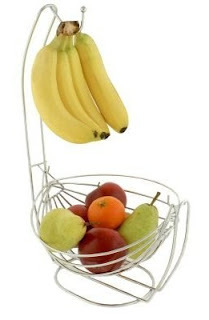 Right now at Amazon, you can get a nice fruit basket bowl and banana hook combo for only $9.99 shipped. This regularly costs $24 and has great reviews! It is made of high-quality stainless steel so it is strong and durable. The top banana hook is long and strong to hold a large bunch of your favorite slippery fruits. The lower swinging basket features a large bowl with an open air design. This design prevents odor/taste crossover.